Ice Cream Bonbons, is one of those little fantasy foods that we all have joked about. Who hasn’t said they were going to sit at home and watch tv, and eat some bonbons? While, we have all entertained this fantasy, when you go to the store to by your bonbons, they come in one, maybe two flavors, and if we are going to sit around and live our fantasy life, we need more than just chocolate and vanilla ice cream treats. With patience these can be made, but the best thing is you can make the ice cream bonbons into any flavor that your heart desires. My personal favorite is to make the bonbons with Neapolitan ice cream, this way you can get vanilla, chocolate, and strawberry all at once. Who doesn't want to stay home all day and make ice cream bonbons? Start by placing a cookie sheet in the freezer to chill, once the try is chilled, you can begin to scoop the ice cream. Use a small cookie scoop to scoop out the ice cream balls. Work very quickly, stop and place the scooped balls into the freezer if they begin to melt. Pop the ice cream balls into the freezer for six to eight hours. The ice cream must be frozen solid before placing warm chocolate on top, or the chocolate will slide right off. Heat chocolate and shortening over a double boiler, you want to gently heat the chocolate stirring until smooth. Then remove the bowl of chocolate off the double boiler, and allow to cool for 5 to 7 minutes. If the chocolate is too hot, it will melt the ice cream immediately and the ice cream will slide off. 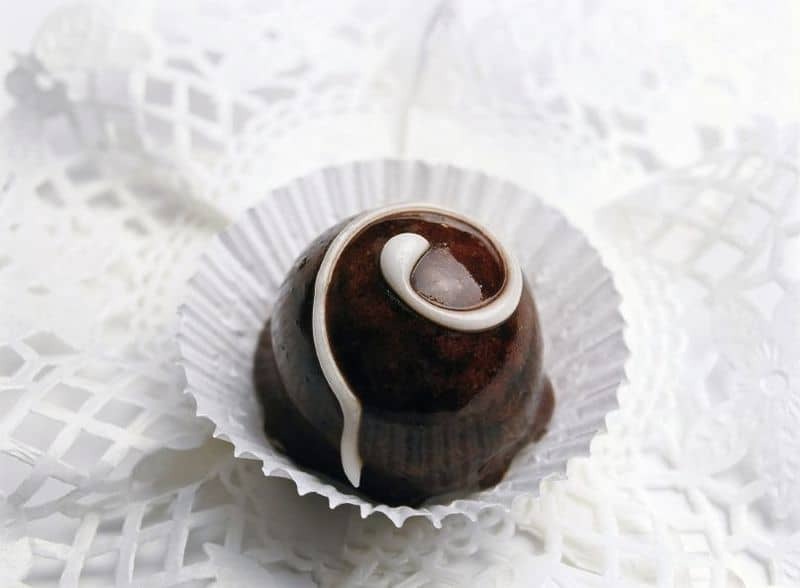 Working very quickly pick up the ice cream ball with resting on a fork, hold over chocolate, and spoon melted cooled chocolate over the ice cream, let the excess drip off, then quickly put the ball down on the cookie sheet, and work with the next ice cream ball. Time is of the essence, work quickly. If you want to add nuts, sprinkles, or any other toppings do so while the chocolate is "wet" an not fully yet. Before eating pop the bonbons back into the freezer for approximately 2 hours before serving. Earth balance shortening is vegan and I could do this with coconut bliss! Yum! Could you use a substitute for shortening for the bonbon recipe? could you use that magic shell to put on top? I have a secret desire to make some of these, and watch some soaps, but wait they are cancelling all of them! What to do? Even Oprah is going off the air, my fantasy is getting messed up now, but at least I can eat some bonbons! These are like cake balls but better. Perfect to bring to a party. Thanks for the post! I’ve always wondered how to make these, so I don’t empty my bank account buying them all the time. Thanks for sharing! I may need to fulfill every cliche about stay-at-home moms and spend one afternoon on a lazy chair will a bucket of these.